"The problems come from Tami's games and matches. On the whole they are very good problems. Each solution begins with Tami stating her original justification for the play that turned out to be an error. Kit responds by making a case for some other play or by asking a key question about the logic behind Tami's choice. The dialogue proceeds with each bringing in additional objections, elucidations, and explanations, until the case for the preferred choice has been made. COVER: "There are many great backgammon books currently on the market. But when I read them I felt as if something were missing. The concepts the authors were explaining made perfect sense but applying them over the board just continued to escape me. Then I figured out what was wrong. These were not the errors I commonly made. Mine were much worse! I would have been thrilled if I would have been struggling with such subtle nuances over the board. These books were written for people who understood things I didn't even know I didn't know yet. It was as if I were standing in the barren wilderness of confusion while the authors of these volumes of wisdom were across the river of knowledge in the promised land of backgammon brilliance. As an intermediate player, I barely knew what a bridge was, let alone where it was or how to cross it to gain this vast wealth of knwledge just over the river for the taking. The guards of match equity tables and game winning percentages were holding me at bay ..."
Have you ever felt this way as you read a backgammon problem book? Have you wished that authors spent more time explaining the sort of common-sense problems that occurred in all your games, rather than the esoteric problems that top players find interesting, but which don't have much to do with the way you play backgammon? If so, then Understanding Backgammon is a book you'll like. Kit Woolsey and Tami Jones look at 101 problems that are typical of the situations that cause difficulties for advanced and intermediate players. Tami describes the positions through her eyes, and Kit, with his usual clarity, isolates the key features of the position and shows Tami the best way of visualizing the answer. 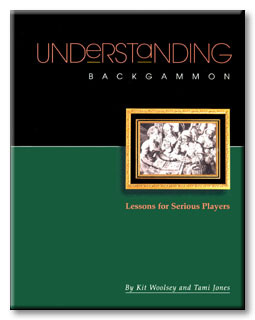 Understanding Backgammon is a great problem collection and a great tool for taking your game to the next level.